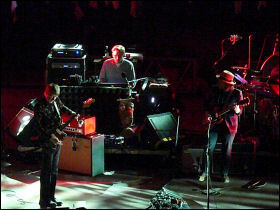 Wilco played two consecutive nights at Red Rocks in June 2012. I saw the Saturday night show. It was hot in Morrison, but not unbearably so. High temperature records were broken throughout Colorado over the weekend. So, I was happy to find a good shady spot to wait in line for the doors to Red Rocks to open. This was also the day that the Waldo Canyon fire caused parts of Colorado Springs to be evacuated. Dr. Dog played first and I really enjoyed their set. They had good energy and I liked their songs. Wilco opened with "Misunderstood". That song played live impressed me when I saw them play it at the Pikes Peak Center in Colorado Springs a few years earlier, but it was much more impressive at Red Rocks. There is a section at the end of the song when the band stops and starts playing several times very loudly and abruptly. The sound of that musical assault echoing off of the rocks at the Red Rocks Amphitheatre was amazing. One of my all time favorite Wilco songs, "Art of Almost" was next. This was a nice and precisely played version. I could tell the band and especially Jeff Tweedy were singing and playing well. Unfortunately, I did not capture a complete recording of this concert. A few more songs into the show I noticed the levels on my Tascam recorder were not moving up and down the way they should. I determined that the recorder had over heated and was recording distortion instead of music. I turned the deck off and let it cool down for a while. This was disappointing, because the band were playing so well and the sound was so good. I rarely leave a show I want to record without a viable recording. The next highlight song of the show was "Impossible Germany." That song is just pure Wilco bliss to me. Tweedy's singing and the band's musical accompaniment are so good on that song. It's so beautiful and laid back. I can't write about this song without mentioning Nels Cline's guitar work. His solo during this song is sublime. Just hearing that was worth the admission price. The behind stage set-up and lighting of it was unique. 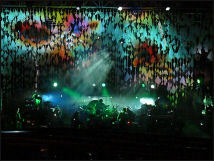 There were many white pieces of fabric suspended behind the band forming a curtain that the lights illuminated. Some of the pieces of fabric had lights built into them too. The use of long strips and pieces of fabric as a screen to shine lights on was a lighting scheme I'd never seen before (top, left). The middle of the show was well played, but slightly predictable with "Passenger Side" and "Whole Love". But, hey, this is Wilco. All of their songs are good! The sound from the PA system was very good were I sat, centered just behind the soundboard. My Tascam recorder cooled down and started recording clean music again a few songs before the first encore started. So, at least I have a recording of the encores. The band come back for the first encore after "Dawned On Me" and "Hummingbird" closed the set. "Forget the Flowers" was nice to hear. "Jesus, Etc..." was next and provided a good mellow vibe for the end of the night. The second encore started with Tweedy explaining how the audience could and should participate during the next song "Kingpin". During the song, Tweedy sang, "I want to be your King Pin... living in... Morrison." The audience loved hearing that. I really enjoyed the song choices for the second encore. The songs they played, included "I'm the Man Who Loves You", "I Got You (At the End Of the Century)" and the popular "Casino Queen." The band finished up the evening with "Dreamer Of My Dreams" from their second album Being There. They were rewarded with enthusiastic applause as they left the stage. Two encores with ten songs played sent us out into the night very happy, but still wanting more. As we walked out of the venue, fans were discussing what they just saw and heard. The consensus was that it was a great Wilco concert. Wilco is one of those bands that you just have to see, and especially hear live to fully appreciate them. Go out and see them play if you get the chance.